Today’s smartphone will not be called as such if it isn’t smart enough to perform day-to-day functions that affects our lives. One proof? – the plethora of mobile applications available on various platforms. These mobile apps vary from the most useful to the most absurd ones. One app which smartphones are supposed to come in handy is for travel purposes. There are various travel-related apps available on various smartphone platforms. But are these applications being maximized by users? 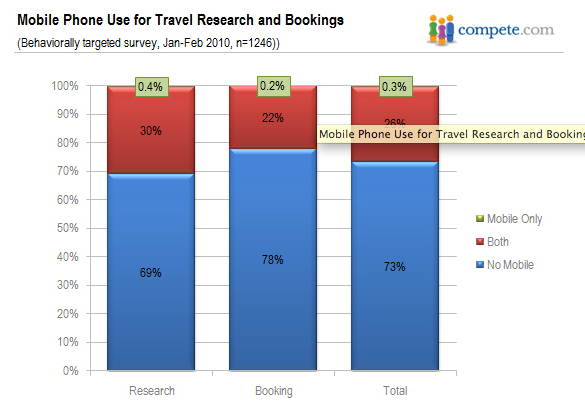 Compete’s analysis of available data shows that indeed, smartphones are being used for travel purposes. The bad news is, the usage is not significant enough, leaving more room for, growth perhaps? 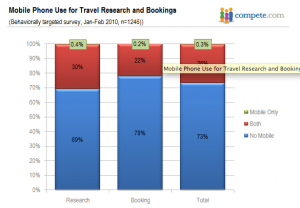 Compete’s study utilized behavioraly targeted surveys that asked smartphone users whether they use their smartphones for travel research and booking. Surprisingly, 69% of the respondents to Compete’s survey said that they do not use their smartphone’s for travel purposes and 78% said they don’t use smartphones for travel booking as well. Quite interestingly, the survey also revealed that respondents see their smartphone’s usage more for post-travel bookings. These pertain to following up room availability, check-in time and other travel-related activities that you need to do. The survey thus revealed that smartphones are not replacement tool but rather additional tools that aid users in their travel-related needs. And smartphone’s usage to follow-up bookings and other travel-related purposes are still growing despite the relatively low usage. The fact is smartphones can be used in various ways that we can possibly imagine. And one of these is for travel bookings and other related information.